Renovating Your RV Cabinets: Is Renovating Your Recreational Vehicle Cabinets Worth While? Is Renovating Your Recreational Vehicle Cabinets Worth While? When the children or grandchildren are little, a banquet table and benches can be handy both for eating and extra sleeping space. Because life isn’t stagnant, with time, needs change; nothing remains the same…except the coach, travel trailer, the RV that we were in love with when it was new. Well, RV Outfitters can make the changes needed for the changes we enjoy in life. 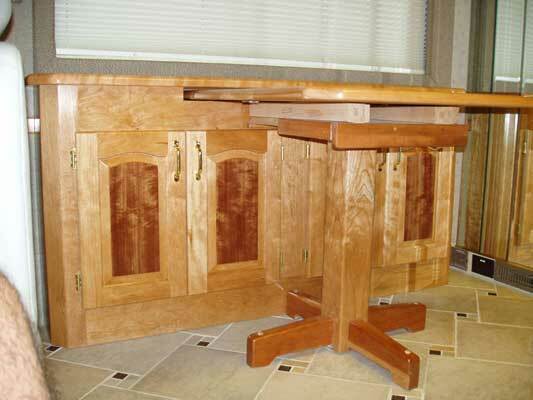 Quality craftsmen can convert the table and bench area to hold a fold-away table, new RV cabinets for a comfortable computer station, a scrapbook center, or any other custom RV cabinet need. Don’t waste space on someone else’s idea of how your space should be arranged. owners owners Jim Sizemore & Greg Fulton and their craftsmen can customize for functional Recreational Vehicle cabinets and tables that will utilize space and fit seamlessly into the existing cabinetry. One of the first needs seems to be better television viewing, especially with HDTV knocking at our doors! This viewing inspires better seating. 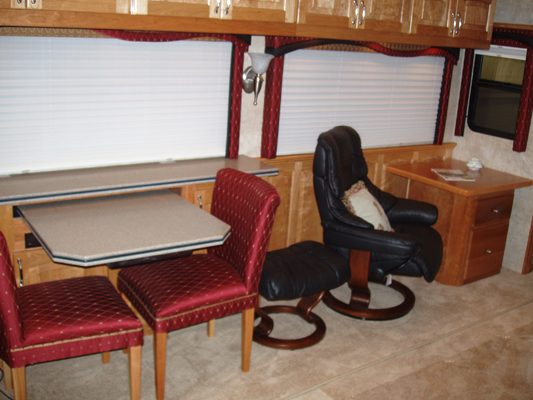 Whether replacing the sofa with custom RV chairs, or upgrading the sofa with leather and a quality hide-away sleeper bed, RV Outfitters makes the renovation worth while. It pays to protect your initial investment with upgrades. It provides quality time to travel and living. With a well placed end table, a comfortable chair that fits, and the flat-screen HDTV with surround sound, TV viewing becomes a better entertainment experience for everyone. Satisfied customers like Judy and Tom can’t speak highly enough about the wonderful, customized work in their coach. Talking and planning with people who are experts and want you to be pleased makes for satisfied customer relations that are unique today. Planning first for upgrades when making replacements protects that initial investment of the motor coach or travel trailer. Eventually, a second area for replacement is as close as our feet, since all flooring begins to show age and wear over time. Whether carpet, tile, or engineered hardwood is in your future, experts at RV Outfitters are ready to work with you to plan for the renovation that will excite you about your coach, and upgrade the existing flooring for ease of living. While the right renovation can create the comforts you’ve desired, upgraded flooring can speak of quality that lasts. Engineered hardwood flooring lasts a lifetime. It can be refinished, resurfaced, or individual boards replaced, if a disaster should make it really necessary. Tile can make floors unique and artistic or clean and stylish while offering easy clean-up. With choices available in stone or porcelain tile and cork or bamboo flooring, the hardest part is making a choice. Owners Jim Sizemore & Greg Fulton at RV Outfitters will work with your ideas when you are ready. Don’t trade; renovate for the quality and customized space you yearn for.